6 Ways That Inexpensive Barcode Labels Cost You More over Time! Are You Paying These Hidden Labeling Costs? When it comes to buying barcode labels, you might think cheaper is better. After all, who wants to spend more for something as simple as barcode labels? But many companies who think they are saving money on barcodes are later surprised to find out how much “cheaper” labels really cost, especially once they realize how much extra money they end up paying in premature printhead replacements, lost productivity, and workflow disruptions from scanning issues. Here are the six ways that cheap barcode labels cost more over time and how you can ultimately save money and headaches by investing in better quality supplies. 1. Low-cost labels are usually made of low-quality materials. That makes them cheaper to produce, but cheap labels often have rougher surfaces that damage your printer’s printhead and cause premature wear. That will cause your printhead elements to fail prematurely, which costs you hundreds or thousands of dollars in early replacements. It can also cause poor print quality and render barcodes and label information unreadable, which means your workers will be wasting time having to reprint and re-scan. 2. Cheap direct thermal labels often have issues with heat sensitivity due to their lower-quality materials. This means ink doesn’t transfer as well to the label, and you may end up having to make constant printer setting adjustments to avoid barcode scanning issues. 3. If you’re using pre-printed colors on your labels, your colors can actually end up transferring to your printhead and causing an ink buildup when you’re using cheaper, lower-quality materials. The buildup slows down your printing and can cause print quality issues, resulting in more wasted time and cost on reprinting and re-scanning. 4. If you choose cheap labels and they’re not made with the right materials to withstand the conditions where you apply and use them, you can easily end up with damaged and unreadable barcodes and information. This is especially important if your labels will be exposed to sunlight, moisture, water, or chemicals. 5. Adhesion is another common problem with low-cost barcode labels because they’re often produced with substandard adhesives that aren’t matched to specific labeling applications. Your labels can end up peeling or falling off, leaving your assets, products, or shipments unidentified and not trackable. 6. If you’re buying cheap labels, they’re probably not matched to your printer ribbon, which can quickly cause print fading and rub-off. Ultimately, to minimize long-term label, printing, and operational costs, companies should invest in higher quality labels and match the right labels and supplies with their unique application requirements. Our best recommendation is to invest in Zebra-certified printing supplies, which are manufactured with consistent and ISO-certified processes, so you get the highest quality and performance. Zebra labels are rigorously pre-tested on Zebra printers and in specific applications to assess printhead wear, print quality, adhesion, durability, and scannability. Zebra has over 500 stock labels, ribbons, and supplies to choose from, with specialized materials for any application and environment. Their superior quality means they perform flawlessly, reduce your printhead wear and related costs, reduce your supplies usage, and can save you thousands of dollars in reprinting, wasted labels, re-scanning, printer adjustments, servicing, and printhead replacements. As an added bonus, if you use Zebra printers and agree to use Zebra supplies exclusively, you get 100% protection against premature printhead failure. If a printhead ever fails prematurely, it will be replaced at no cost. 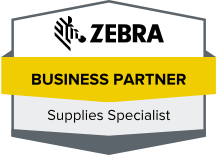 To learn more about Zebra supplies and get expert advice for your application, visit Tri-State Business Systems, call 908-359-8001, or email us now. In order to ensure that lab samples would not be contaminated with any foreign particles, technicians thoroughly cleaned lab sample collection vessels with a heavy dose of IPA. The ideal process was to label the sample collection vessel prior to this IPA cleaning. Unfortunately, the old cleanroom label could only withstand a brief wipe with IPA without losing legibility of the cleanroom label that had been placed on the collection vessel. The inability of the cleanroom label’s ability to withstand this extreme environment, dictated a process change. The process was modified such that the collection vessel would first undergo the heavy doses of IPA prior to being labeled. Once the cleanroom label was applied, an additional step was added to wipe down the vessel again with a less aggressive cleaning. Although this new process solved the legibility issues, it added an additional step in their process and also created the possibility of contamination. The need was for an extreme environment class 100 cleanroom label that could be applied to the collection vessel prior to the IPA cleaning so the vessel could be thoroughly cleaned after the cleanroom label had been applied. There was no commercially available extreme environment direct thermal printable cleanroom label material that met the class 100 cleanroom label requirements: 1. print the label in order to uniquely identify the collection vessel, 2. apply the label to the collection vessel and then, 3. thoroughly clean the vessel with aggressive amounts of IPA, while not losing legibility of the label’s print. Working closely with engineering, Lgi researched multiple materials and constructions that would meet these requirements. Multiple candidate constructions were developed and tested until the final solution was achieved. This solution also included a print treatment which further improved the performance of this label. Finally, this extreme environment cleanroom label was qualified for use within the process. I was present at the facility with their engineering team and printer supplier, Tri-State Business Systems, doing a demonstration of Lgi’s solution. Cloths soaked in IPA were placed over both Lgi’s new label and the old label. We met for about an hour on another project and came back to the demonstration at the end of that meeting. It was amazing to see how the new Lgi label retained its integrity and complete legibility and you could not discern anything on their old label. Here are the top trends you can expect for Thermal Transfer Ribbons in 2019. Find out what you need to know to stay ahead in the thermal transfer industry. The National Association of Manufacturers reports that US manufacturers’ optimism for the year reached 92.4%. While general purpose wax barcode labeling is common for shop floor materials management and logistics, wax resin and resin ribbons are outpacing GDP growth and are being used more for product identification. These higher durability ribbons, like TSBS Resin Printer Ribbons, perform well on BOPPs and polyesters used in automotive, industrial, chemical and outdoor applications. According to Labels & Labeling, printing solutions are expected to become even more consumer-focused with packaging personalization and customization at the forefront. How can a thermal transfer ribbon provide customization? Printing color tags and labels can reinforce brand recognition and add visual highlights using existing thermal transfer equipment. Examples of TTR customization has been seen on pre-printed labels in cannabis, personal care products and even hardware. Looking for a custom color? We can provide thermal transfer ribbons in any exact color match. Contact us for more information.